This off the shoulder top is such a favorite of mine. I fell in love the second I saw it and it's grown more and more after I've styled it different ways. The fabric is amazing - it's light enough to keep you cool even on the hottest summer day. 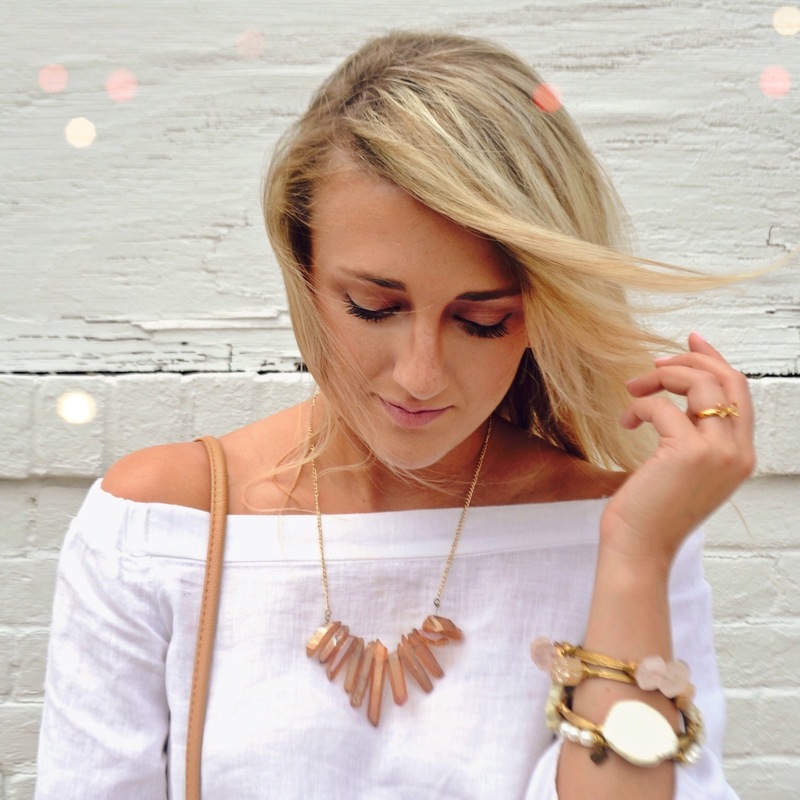 Read more about this look by clicking here! As the temperatures started to rise, I started researching books to read this summer. Of course one of my first stops was Lauren Conrad's summer reading list. 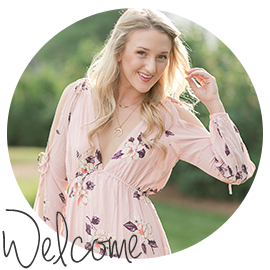 If you'd like to read more about her picks, you can do so by clicking here! I'm saving this little number for my flight in just one week from today. 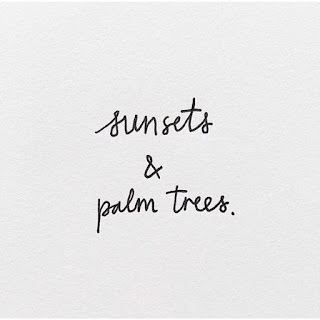 Keep reading to find out where I'm jetting off to! I cannot get enough of this mother/daughter duo. Hello! 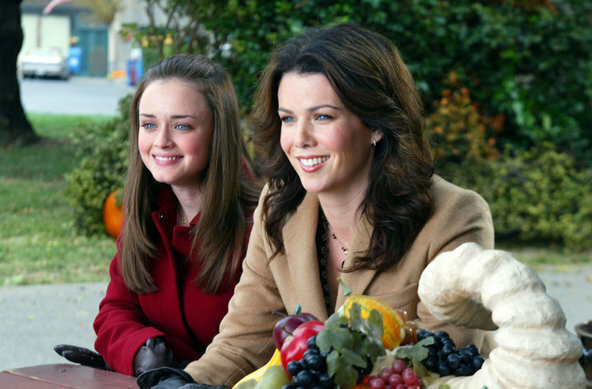 Who doesn't love Lorelai and Rory?? Ever since I've gotten wind of the reunion (does anyone know an official release date?! ), I've been reliving all the laughs and cups of coffee these two showed us over the years. Ahh, The Freight House. Our beloved farm to table restaurant here in Paducah. Excuse the fact that I had already munched through my half of the burger *blushing*. In my defense, it was topped with pulled pork! How are you supposed to resist that first bite (or three) before snapping a pic? Anyways! The Freight House just opened their (drum roll please) - patio! Ahh, patio season. You know what that means, ladies! Rosé season. It's arrived and I can't get enough! This particular ice cream cone is from the Ice Cream Factory in Downtown Paducah. For those of you who are from Paducah, you know the summer spot I'm referring to. They're only open seasonally so grab a cone while you can! I actually wrote a whole post about them this past Friday - check it out by clicking here! 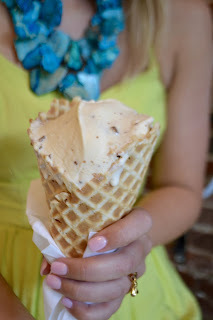 I have good news for those of you who love waffle cones but hate the calorie count! I've found a little health hack to enjoy your waffle cone within breaking the daily calories. Okay so you know those Chobani "flip" greek yogurts? They have the yummy little fixings - click here to see what I'm talking about if you've never tried. Okay well you mix one of those up then dump it in a waffle cone. The waffle cones I found at the grocery only have 50 calories! So we're talking 250 calories total plus greek yogurt actually has health benefits while the ole Ben & Jerry's - not so much. I spotted this rosé back at the start of the season and I've been in love ever since! For starters, it's under $15 so hello budget friendly!! The candle next to it is from my sweet Simply B :). This candle is a favorite of mine especially in the spring/summer. It's such a soft scent that illuminates the room in just minutes! Definitely a must have. This time next week (plus one day), I'll be Charleston! E is spending the summer there doing an internship and it's been weeks since we've seen each other. 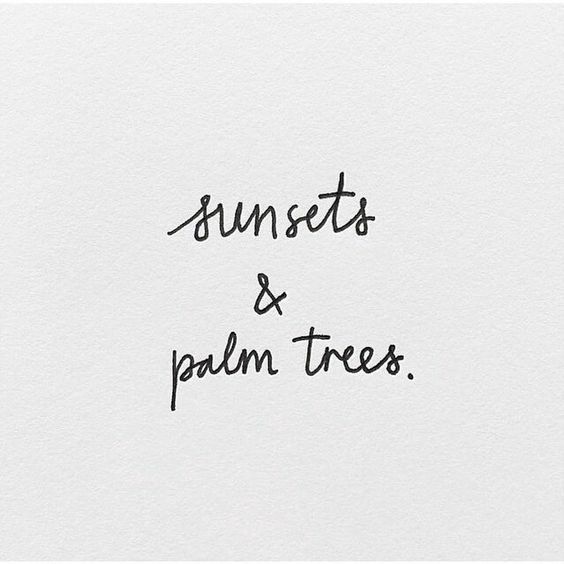 Needless to say, I'm anxious for the Charleston palm trees, Charleston sunsets and some quality time together. Eek! Can't wait to explore the city together. Make sure to follow me on Snapchat (@kitty_621) for some Charleston snapshots. I'm a big planner. If I'm going on a trip next week, I'll start planning outfits then and there. That way, I have all the outfits laid out and can think of what jewelry to put with it. Ah ha. Now we have the whole outfit but who wants to just throw those precious jewels into any old bag? Not I.
I ran across this bag on Caitlin Covington's blog (Southern Curls and Pearls) a few months ago. As soon as I laid eyes on it, it soared to the top of my wish list. 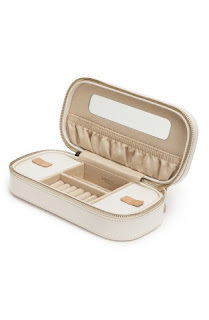 I mean, there are compartments for everything! It's every blogger's dream travel bag :). Thank you so much for stopping by and getting the scoop on all the latest with #chicandshimmer! Love this post! Your off the shoulder top is so cute. Also, I spell my name"Kathryn" the same was as you!! It's fun to see other people use this spelling, most of the time I see it spelled differently! Thanks Kathryn! It's so fun to hear from another Kathryn who spells their name the same! I love the uniqueness of it, don't you?? Give me ALL of the rose please! 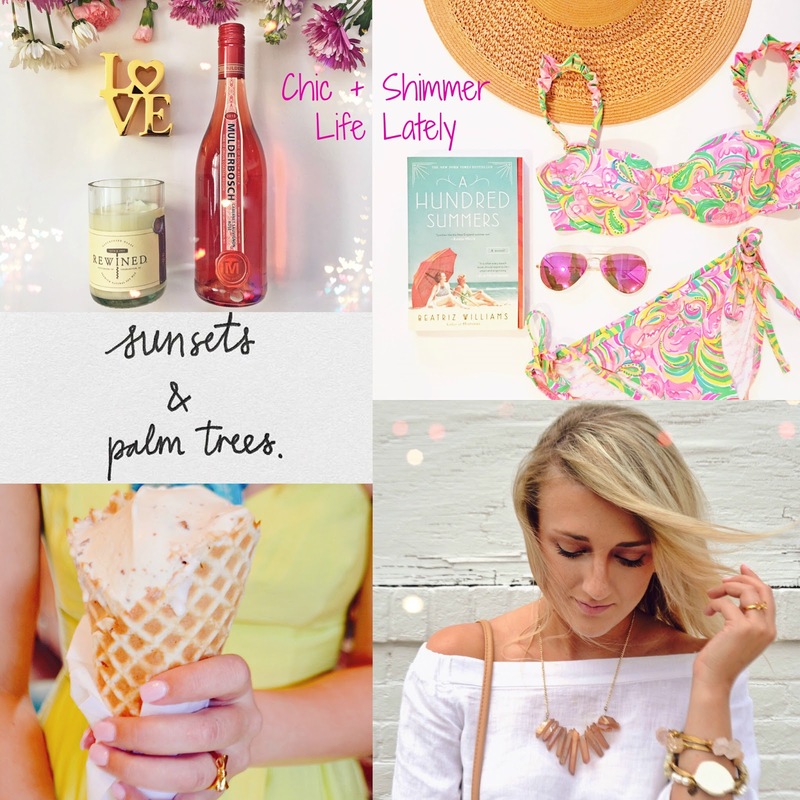 Love this roundup! I'm OBSESSED with the Chobani Flip Cups! I've tried three flavors, and my favorite is the coffee one! Your summer is off to a killer start! 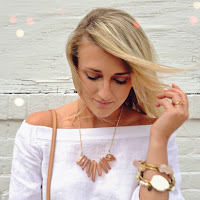 Love the off-the-shoulder top!